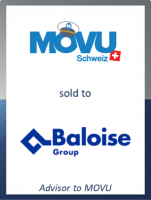 GCA Altium acted as exclusive financial advisor to MOVU, Switzerland’s biggest digital platform for home-moving services, on its sale to Baloise Switzerland, a provider of prevention, pension, assistance and insurance solutions. MOVU AG is a Swiss start-up founded in Zurich in 2014 by Laurent Decrue, Nenad Nikolic and Nicolas Bürer. Within a very short space of time, it rose to become the biggest home-moving services platform in Switzerland. Its business model is centred around the arrangement of convenient and reliable home moves for the consumer market. MOVU sources transparent quotes from certified moving and cleaning companies. The quotes that best suit the customer can then be booked directly on the site and the customer can even get free advice from MOVU’s independent removal experts. MOVU will continue to operate independently in order to retain its agility and innovative capabilities. However, Baloise will be investing in the collaboration with the aim of developing common solutions and accelerating the growth of both companies. With the acquisition of MOVU, Baloise, headquartered in Basel, Switzerland, has taken a further step in implementing its Simply Safe strategy. The changing security, safety and service needs of society in the digital age lie at the heart of its business activities. The move into this market means that Baloise can now expand its offering with new services that will enhance and complement its traditional insurance business. Michael Müller, CEO of Basler Versicherungen Switzerland, said: "I am delighted that we are able to announce a further milestone in Baloise’s new strategy in the current year with the takeover of MOVU. By making this purchase we are not only investing in Switzerland’s biggest home-moving services platform, we are also acquiring invaluable expertise for the platform business that MOVU has built up. Together with the MOVU team we are looking to grow the core business in this segment and add new services." This deal adds to GCA Altium’s extensive track record in the Internet and eCommerce space, having completed 26 transactions in this industry since 2015.